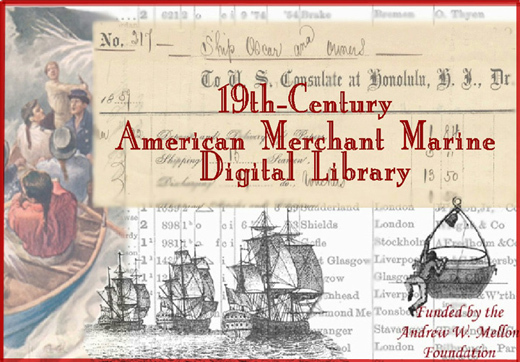 From: American Maritime Documents, 1776-1860 – Stein, Douglas L.
1789 Three acts passed in July creating U.S. Customs Service. 1789 Chapter IX, Section 4. An act for regulation of pilots. 1790 Chapter XXIX, Sections 1 through 9, Act for the government and regulation of Seamen in the Merchant Service; contracts with crew, desertions and required provisions. 1792 Chapter XXIV, Sections 1 through 6 and Section 9 (Sections 7 & 8 repealed). Act concerning Consuls and Vice-Consuls concerning powers and duties. (Established U.S. Consular Service). 1792 Chapter I, Sections 1 through 30. Act for registering, recording and clearing vessels. 1793 Chapter VIII, Sections 1 through 37. Act for enrolling and licensing ships or vessels in the coasting trade and fisheries and regulating same. This act includes laws pertaining to cargo manifests. 1796 Chapter XXXVI, Chapters 1 through 8. Act for the relief and protection of United States seamen including appointment of agents to act on behalf of said seamen in case of impressment or detention by a foreign power. 1797 Chapter VII. Act concerning registering and recording ships or vessels and licensing ships and vessels in the coasting trade and fisheries in the case of lawful sale or transfer. 1797 Chapter V. Act concerning registry and recording of ships and vessels in the event of seizure or capture by a foreign power, or by sale become the property of a foreigner. 1798 Chapter LXXVII, Sections 1 through 5. Act concerning relief of sick and disabled seamen including fees and regulations for hospitals. 1802 Chapter LI, Sections 1 through 7. Amendment of Act for relief of sick and disabled seamen which provides for relief of foreign seamen. 1803 Chapter XVI, Sections 1 and 2. Supplement to act providing passports for vessels of the United States. 1803 Chapter XVIII, Sections 1 through 4. An act in addition to the act concerning registering and recording of vessels of the United States and to regulate the collection of duties on imports and tonnage. 1804 Chapter LII, Sections 1 and 2. Act to amend the act concerning registering and recording of vessels. 1805 Chapter XXVIII. An act to amend the Act of 1790, Chapter XXIX, Section eight, an act concerning regulation of seamen in the Merchant’s Service. 1810 Chapter XIX. Act to prevent the issuing of Sea Letters to certain vessels. 1811 Chapter XXVIII. An act in addition to the Act of 1803, Chapter IX concerning Consuls and Vice-Consuls and protection of American seamen. 1812 Chapter XLII, Sections 1 through 14. Act for regulation of seamen on board public and private vessels of the United States, concerning citizenship of such seamen. 1813 Chapter II, Sections 1 and 2. Act for the government of persons in certain fisheries regulating employment of fishermen and shares of proceeds of fishing voyages. 1817 Chapter XXXI, Sections 1 through 7. Act concerning navigation of the United States to regulate imports form foreign ports, citizenship requirements for crews on fishing vessels and trade between U.S. ports. 1819 Chapter LXXXVII, Sections 1. Act to protect the commerce of the Untied States, and punish the crime of piracy. 1825 Chapter XCIX, Sections 1 through 5. An act to authorize the register or enrolment and license to be issued in the name of the president or secretary of any incorporated company owning a steamboat or vessel. 1830 Chapter XIV, Sections 1 and 2. Act to authorize surveyors, under the direction of the Secretary of the Treasury, to enroll and license ships or vessels to be employed in the coasting trade and fisheries. 1831 Chapter XCVIII, Sections 1 through 4. Act to regulate the foreign and coasting trade on the northern, north-eastern and north-western frontiers of the United States. 1831 Chapter CXV. Act concerning vessels employed in the whale fishery concerning register or enrollment and license. 1837 Chapter XXII. Act concerning employment of pilots. 1838 Chapter CXCI, Sections 1 through 13. Act to provide for the security of the lives of passengers on board steam-propelled vessels, and inspection of these vessels. 1840 Chapter VI, Sections 1 through 3. Act to cancel the bonds to secure duties upon vessels and their cargoes, employed in the whale fishery, and to make registers lawful papers. 1840 Chapter XLVIII. Act regulating the shipment and discharge of seamen, and the duties of consuls. 1843 Chapter XLIX. Act amending the act for the relief of sick and disabled seamen to be extended to masters, owners and seamen of vessels in the coasting trade. 1843 Chapter XCIV, Sections 1 through 6. Act to modify the Act of 1838, Chapter CXXI, to provide for the better security of the lives of passengers on board steam vessels. 1848 Chapter CXLI, Sections 1 through 3. Act to authorize the Secretary of the Navy to license yachts used as pleasure vessels. 1850 Chapter XXVII, Sections 1 through 8, Act to provide for recoding conveyances and sales of vessels. 1851 Chapter XLIII, Sections 1 through 7. Act to limit liability of ship owners, and to make charterers of vessels liable in same manner as owners. 1852 Chapter CVI, Sections 1 through 44. Act to amend the act to provide for the better security of the lives of passengers on board steam vessels, regulating inspection, safety measures and licensing of such vessels. 1852 Chapter CXIII, Section 5, Act regulating delivery of U.S. mail carried on ships. 1852 Chapter IV. Act authorizing the Secretary of the Treasury to issue registers in certain cases. 1855 Chapter CXXXIII, Sections 15 through 20. Act to remodel the diplomatic and consular systems of the United States. 1855 Chapter CCXIII, Sections 1 through 19. Act to regulate the carriage of passengers in steamships and other vessels, including those employed by the American Colonization Society, or such society of any state, to transport colored emigrants to the coast of Africa. 1856 Chapter CXXVII, Sections 20, 25 through 28. Act supplementary to the Act of 1803, concerning Consuls and Vice-Consuls and for the further protection of American seamen, and to provide for discharge and desertion of seamen.